A few years back, Audi pledged to bring in diesel variants of every model sold in the United States. As of the Los Angeles auto show, the German automaker can now boast that it has the most comprehensive diesel product line of any automaker, spanning the gap from the compact segment through full-size sedans and crossovers. All new TDI models will come with Audi’s 3.0-liter V-6 TDI clean diesel, rated at 240 horsepower and 406 pound-feet of torque. Compared to their gasoline equivalents, each TDI model can deliver up to a 30-percent improvement in fuel economy, while producing 30-percent less carbon dioxide. Though the horsepower may seem merely adequate, 406 pound-feet of torque ensures that acceleration isn’t lacking. The new A8 TDI, for example, will run from 0-60 mph in 6.4 seconds, which makes it comparable to gasoline-powered full-size V-6 sedans in the segment. Then there’s the added range to factor in: in the case of the Q7 crossover, a full tank of diesel will get you an estimated 700 miles down the road. First to market is the 2013 Q7 TDI crossover, which hit dealers in September. 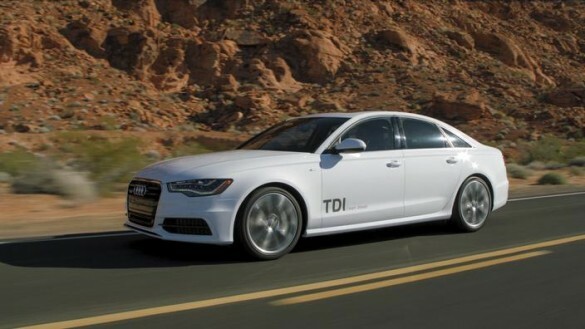 The new models debuting in Los Angeles include the A8 TDI sedan, due in the spring of 2013 as a 2014 model. This will be followed by the launch of the A7 TDI, the A6 TDI and the Q5 TDI, all scheduled to debut in the fall of 2013 as 2014 models. Copyright 2012 100 Hot Cars.